Experience a winter wonderland of rugged Canadian Shield, majestic hardwood forests, old growth white pine, hemlock and yellow birch. Ski or snowshoe to cliff-top lookouts and spectacular ice falls. Catch a glimpse of wildlife such as moose, deer, owls, martens, grouse and much more. The Frost Centre ski and snowshoe trails offer adventure and discovery for the whole family, only three hours north of the GTA. 21 km of classic cross-country ski trail offer eight stacked loops ranging in length from 1.2 km to 6.5 km. Beginner to expert level trails, we have it all. Families can explore the Fox, Bunny, Bear, Beaver and Otterslide trails. If you are looking for a longer, more remote backcountry experience try the Deer trail! Several trails offer technical downhill sections for advanced skiers. For detailed trail descriptions, click here. Facilities include two on-trail, self-serve warm-up cabins (equipped with wood stoves and breathtaking winter views), rentals, historic Towerman's cabin, washroom, outdoor toilets and parking. Our Trails office/store is open daily from 10 a.m. to 3 p.m. (November - April). The store stocks ski wax and hot chocolate! Be sure to check out this great YouTube video featuring a day on the Frost Centre ski trails! SNOW DEPTH: Varies, expect some standing water in low lying areas and possible bare spots. GROOMING: Deer and Marten Trails are not groomed. MOOSE TRAIL - Beech bark disease has severely affected trees throughout the entire Moose Trail cross country ski loop. For the past several seasons we have worked diligently to keep fallen trees off of the trail and remove dead standing trees to ensure the safety of our trail users. Unfortunately the rate of infected beech trees has reached a critical point and there are hundreds of dead standing beech trees surrounding the moose trail, all of which are rotting and falling at an alarming rate. These trees are susceptible to 'beech snap' which is when large limbs break off without warning. This creates a major safety concern to trail users and for that reason the Moose Trail remain closed at this time. Staff will continue to monitor and maintain the Moose Trail until it has been decided it is acceptable to reopen the trail. For more information about the Beech Bark disease infecting our forests visit https://www.ontario.ca/page/beech-bark-disease. Thank you for understanding. NOTES: SEND US YOUR SKIING PHOTOS! We would like to feature your photos in print ads and on social media! Send photos to trails@algonquinhighlands.ca. Please obey all signs and stay on groomed trails. Ski trail passes may be obtained at the Trails Office located directly across the road from the trailhead. On weekends, passes are available at the trail head ticket booth. If you wish to ski outside of regular hours - no problem! Just register at the self-registration shelter at the trail head. Be sure to bring correct change to place in the box. Accommodations - Numerous local accommodations provide everything from just a simple room and bed to full scale resort services. Call us at 705-766-9033 for recommendations. Seasons Passes- Hurry, and get yours today! Individual and Family Passes available. FROST CENTRE RECREATIONAL SNOWSHOE TRAILS ARE OPEN BY DONATION AT THE TRAIL HEAD, AND TRAIL MAPS ARE AVAILABLE AT TRAIL HEADS AND AT THE TRAILS OFFICE. . PLEASE FEEL FREE TO CALL THE TRAILS OFFICE (705-766-9033) OR DROP IN TO FIND OUT SPECIFIC TRAIL INFORMATION. SOME TRAILS MAY NOT BE BROKEN SINCE THE NEW SNOW. ALL TRAILS ARE MARKED WITH A BLUE MARKER SYSTEM AND YOU ARE HERE MAPS ARE LOCATED AT EVERY TRAIL JUNCTION. Do note that the bridge that crosses Oxbow Creek at the halfway point on the Beetle Lake trail has been removed and is pending replacement - hikers will not be able to cross the creek and must return via the same route to the beginning using the newly installed mini loops on both the A/O and Elliot Lake Road side of the trail. Watch for logging operations on the Crests of Kennisis Trail - follow signage. The Acclimatization Trail on the Frost Centre Hiking Trails is closed to the south of the western junction with the Fire Tower Trail. This means that the Fire Tower Trail can no longer be done as a loop and hikers using the Acclimatization Trail must finish the 4km loop by following the Fire Tower Trail. Please obey posted signage and respect private property. Snowshoers can trek 11 km of stacked loop trails, located just across the road from the ski trails. After a morning out trekkers can relax, have lunch and talk about all the amazing sights they have seen, while sitting fireside in the historic Towerman's log cabin, located on the shores of scenic Lake St. Nora. 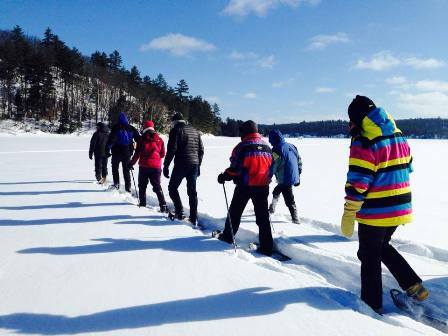 Want more snowshoe trails? All of our hiking trails serve as snowshoe trails in the winter. With 38 km of trails at 10 different trailheads, there are numerous possibilities. For trail descriptions, locations and co-ordinates please view the Hiking Trails page. Please take the time to read our Winter Safety Tips. Please DO NOT use groomed ski or snowmobile trails for snowshoeing. If you encounter a groomed trail while snowshoeing (for example on Beetle Lake Trail, Frost Centre Ski Trails, Sherborne Lake Access Road), please stay off the groomed portion of the trail. Although snowshoe trails are marked with blue diamond markers and inspected several times annually, blow down trees or missing signage can cause sections of the trails to be blocked, re-routed or difficult to navigate beyond. If you encounter one of these problems, please report it to the Algonquin Highlands Trails office at (705) 766-9033. Keep up on our always evolving topics. Enter your e-mail and subscribe to our agenda. Keep up on our latest news. Enter your e-mail and subscribe to our news & notices. © Copyright Algonquin Highlands 2015. All Rights Reserved.